However, outdoor events do have some disadvantages, especially when you have to...umm...relieve yourself of your waters [is that a polite way to see pee?]. Anyway, I'm going to tell you a little story now. It's a true story. I call it "The Parable of the Porta-Potty". Many years ago [Okay. Two weeks ago.] in the land of Sprinklesville lived a fair woman. She labored extensively all of her days preparing to visit Art in the Park. As she was there, she savored every second of the culture, artists, masterpieces, and glorious fair food. Except she savored the glorious fair food a little too much and soon had to use the restroom. "Doth this park have a bathroom? ", she thought to herself. Being the smart woman she was, she looked around herself before asking anyone if they knew where a restroom was. Off in the distance, she spotted a row of little orange towers. A woman's worst nightmare. Figuring this unholy waste depositing system was better than no bathroom at all, our fair lady of Sprinklesville braced herself and held her nose until she could break free into fresh, open air once more. Feeling accomplished, [because using a porta-potty is a very big accomplishment], she walked back to her picnic table in the shade and relished the way normal air smelled [especially when filled with the aroma hot oil for frying delicious snacks]. As she was sitting, she started to notice something funny about the large building one hundred feet or so away from her. At the same time she was pondering the meaning of this structure, Her lovely daughter [That's me! :D] asked asked a question that would change her life for good. "Where didst thou go, Mom? I thought you were just using the restroom?" "I went to the place that thou saidest", the fair woman replied. "All they had were porta-potties." The fair woman of Sprinklesville looked more closely at the large building near their table and realized that she had been so focused on other things that she failed to realize that the large structure was indeed a queenly [well, sort of queenly-- it was still a park] fully plumbed bathroom. Our fair lady [my Mom's] disastrous experience in the lou was a perfect gospel analogy. I know, porta-potties and the gospel of Jesus Christ may seem a little sacrilegious, but stay with me here. 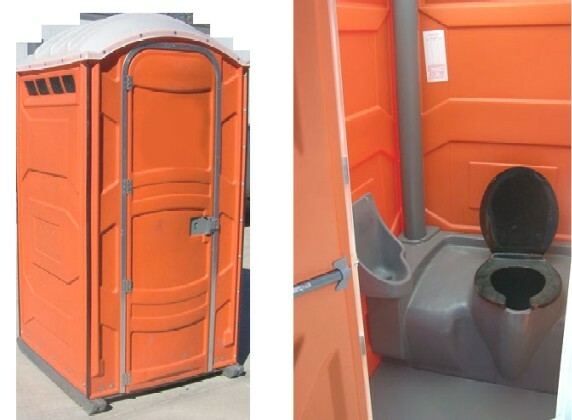 How often do we miss out on the indoor plumbing of gospel living because we're using a spiritual porta-potty? It's easy to fall into the trap of lax obedience, just loosely holding onto the iron rod instead of gripping it with all of our might. But by doing so, we're missing out on even bigger blessings than the modern miracle of indoor plumbing [and that's huge]. Today I want to focus on one aspect of living the gospel that we don't always harvest all the possible blessings from: Scripture Study. Out of all of the world's history, our dispensation has the easiest access to the word of God. In earlier centuries, people died just for trying to obtain scriptures in their native languages. Now, with the touch of a button, we can open the whole gospel library and read the scriptures wherever we go. Additionally, it's generally super easy to get our hands on paper copies, audio recordings, and scriptures.lds.org. Are we using this invaluable gift? Trust me, if anyone is guilty of underestimating the power of meaningful scripture study, it is me. But I'm learning, and I hope it's okay if I share what I've been feeling with you. It is so easy to slip into the habit of quickly reading a chapter a day and calling it scripture study. 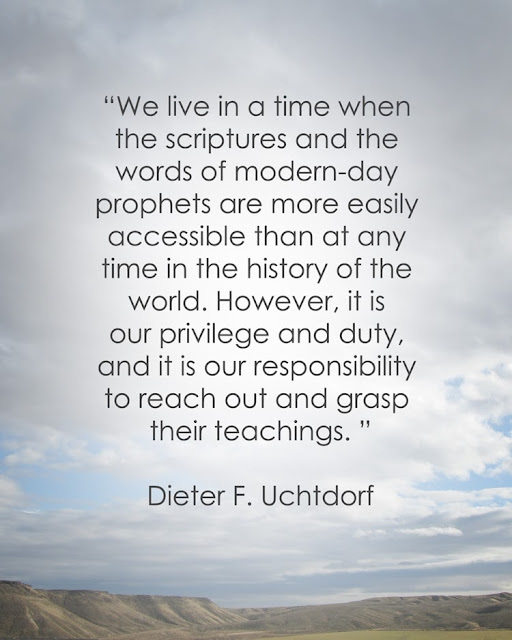 However, the prophets and apostles throughout time haven't counseled us to do "daily scripture glance through" or a "daily scripture skim". They've asked us to do daily scripture study. devote time and attention to acquiring knowledge on (an academic subject), esp. by means of books. "she studied biology and botany"
look at closely in order to observe or read. "she bent her head to study the plans"
Don't get me wrong. 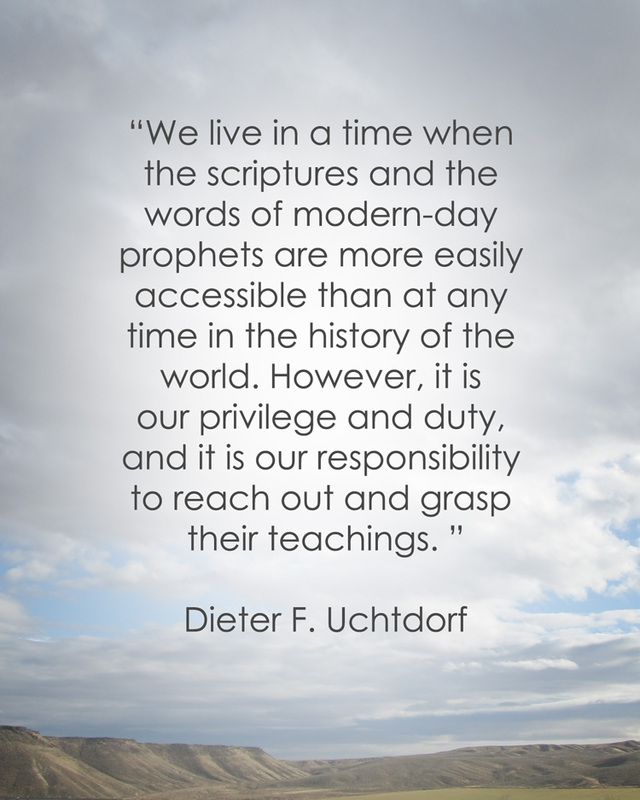 There is nothing bad about reading a chapter a day or reading through the scriptures chronologically. However, we also need to make time to study-- to look closely, observe, and examine what we are reading. Try to really think about what each writer is trying to say and how you can apply it in your life. It may take fifteen minutes to get through two verses, but that's okay. In order to get out of the porta-potty of scripture study and into the indoor plumbing, we've got to slow down and ponder what we're reading. Ask the Holy Ghost to help you understand and find the answers that you need. 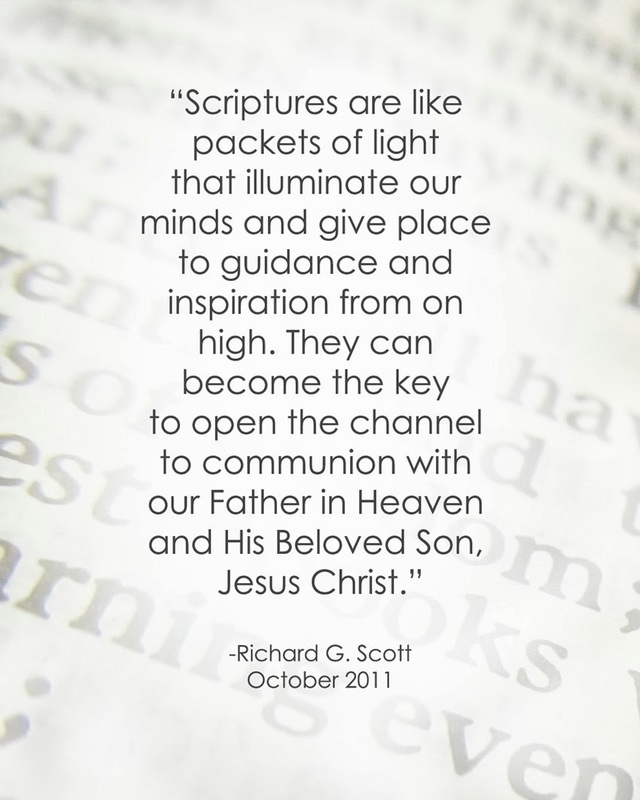 You'll be amazed at all the power the scriptures hold that goes untapped all too often. I can think of nothing that would be more wonderful than an "open...channel of communion with our Father in Heaven and His Beloved Son, Jesus Christ", as Elder Scott so eloquently stated. We can have that. We just have to work for it. 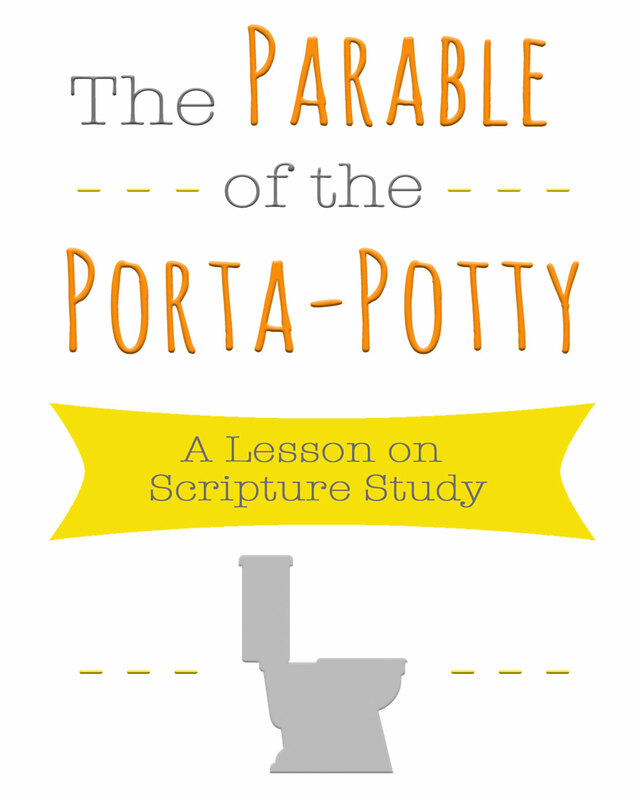 The general consensus: Don't waste your time in the porta-potty of spirituality! Go for the indoor plumbing! You deserve it [and so does your nose ;) ]. What a great story, Sarah. I love your writing style. Very funny dialogue in it and a great analogy. I'm glad I swung by and read it. 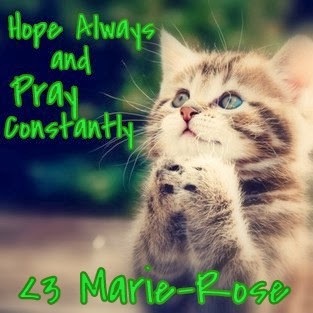 Thank you, Rozanne! Your comment totally made my day. Thanks for reading! 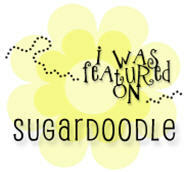 :) I'm so happy to have discovered your blog, too! What an inspiration! I can't wait to read more! This is awesome! I love these quotes and that was a fun parable! This lesson reminds me of the scripture in Alma "do not be slothful because of the easiness of the way." It is made so easy for us now, but there are many, many things also that get in the way and distract us. Wonderful point, Natalie! I love that scripture you shared! It is way too easy to get distracted in this crazy world. I'm so grateful that the gospel can help us stay focussed on what truly matters. Thank you for reading! Thank you so much for this! I am new to the RS Presidency and I am NOT a teacher! I am teaching on Scripture Study in February and a search for "Scripture Study" brought me here...I am so thankful! I tend to use humor when "attempting" to teach, I find that it keeps the listeners attention...this blog post will be perfect to assist me in survival! Robin S.